Join the discussion on our forums! Come discuss Subject 9 over in our dedicated Subject 9 discussion topic. Sleeper of the Boomsday expansion? The card is absolutely insane in hunter. What's stopping Paladins from putting this in their deck? Mainly a lack of good secrets. Secret Pally isn't quite the same without things like Avenge and Competitive Spirit, and in Wild, Mysterious Challenger exists. I still think this should have both Mech AND Beast tag. Surprisingly good in wild spell hunter. This card, lock and load and Yogg carrying me hard in ladder. Thanks team 5! This was my free gold. I'll post my results with it soon. Leaving a comment to see how does it work for,you. Are you going to test it with hunter? I’m curious how would it go in paladin midrange or control. Same for me. Let us know about results. Iv'e only had a chance to use it in a secret hunter deck, which is probably the easiest one to put it in. I had a lot of fun with it and won 35 games out of 49. I played a few games with a added Lock and Load which worked out well. It's better this way, since 4 classes have secrets (mage, paladin, hunter, and yes... rogue). If this were a class legendary, those 3 other secret classes would not be able to use it when it theoretically could be useful. Has anyone noticed that this card is smaller than the others ? Tutor up to 5 and get a 4/4 for 5. How is this not super awesome? I can't believe how much people are sleeping on this especially in a world of Hunter spellstone. 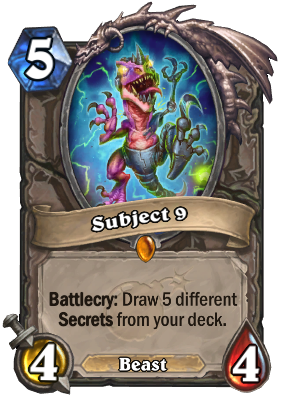 I think it would qualify as awesome if it drew 5 secrets from your deck instead of 5 separate ones. I’ve seen it whiff a lot and only pull one or two secrets when it is dropped on turn 5, and if you don’t draw it until late the stats are underwhelming. For a card that requires you to build a deck around it, the effect isn’t quite powerful enough in Standard currently. Maybe there will be some secrets in the next few expansions. I just love it ! Some love for secret Hunter !